Visit Mr Renfrew's personal website and discover an author Q&A and all the latest updates about his new book, AGINCOURT 1415. You'll be £8.99 closer to your next £10.00 credit when you purchase Agincourt 1415. What's this? On 25 October 1415, a trapped and vastly-outnumbered force of exhausted and demoralised English archers and men-at-arms faced a colossal army of French knights on a desolate field in northern France. What took place that day became one of the greatest moments of the Hundred Years’ War and English history. 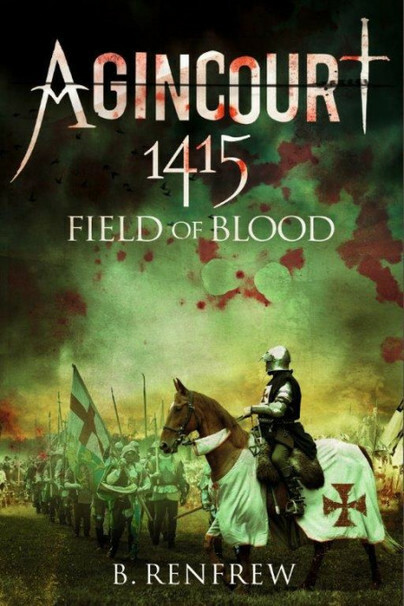 Based on chronicles of the times, Agincourt 1415: Field of Blood is a dramatic, minute-by-minute retelling of the battle as seen through the eyes of the commanders and soldiers on both sides. This is a brutal, bloody and captivating retelling of a major British victory written by a Pulitzer Price finalist This work sets a new standard for historical fiction. This book, provides a succinct yet spellbinding overview of this famous battle. Barry Renfrew has been able to describe the battle in perfect manner and this book may therefore be considered as a part of the ‘standard works’. This books stands out from many other (military) history books, because of the superb way it is written. 5* - It's no wonder to me, after reading this book, why Shakespeare wrote about and probably admired Henry V in full. I am in complete admiration of Mr Renfrew's, what seems like tireless research, into the writing of this book. I was enthralled, first at the dialogue between soldiers, lords, Henry V, dukes and advisors, and second, stunned by the elaborate descriptive in this book. Mr. Renfrew puts the reader right there, in the heat of the battle. It must have been absolutely horrifying to have been present, not to mention the horror of having to have had to fight. Thousands of French to hundreds of English...with an amazing outcome, placed word by word, hour by hour, sometimes minute to minute..so descriptively by Mr. Renfrew. This is a stunning work of non fiction. Thank you to Pen and Sword publishing and to Alex Firth for the perusal. This is a book I will think about for a long time...out of 5 stars I give it a 10!!! This account, of which there have been many, is based on chronicles of the time, and is dramatic version of the battle as seen through the eyes of the commanders and soldiers on both sides. The author takes us on the route of the ragged army from Harfleur on the 8 October, Arques 11 October, Eu 12 October, Blanchetaque 13 October, Boves 16 October, Caix 17 October, Bethencourt 19 October, Athies 20 October, Peronne 21 October, Doullens 23 October, Blangy 24 October and then on the 25 October Agincourt. A foreign correspondent, Barry Renfrew has covered wars in Afghanistan, Africa and the former Soviet Union during 30 years of reporting on political upheaval across the globe. On two occasions he was caught in bombing raids. His reporting won a number of major journalism awards, including The Associated Press Top Reporting Award; he was twice a finalist for The Pulitzer Prize for international reporting. In addition to extensive experience as a war and defence correspondent, Renfrew has a life-long interest in British colonial military history. Previous publications include: Forgotten Regiments and Wings of Empire.